High School and College Approved Kicking Tees. The Ground Zero Onside Kicking Tee is the top selling of all the Kicking Tees. 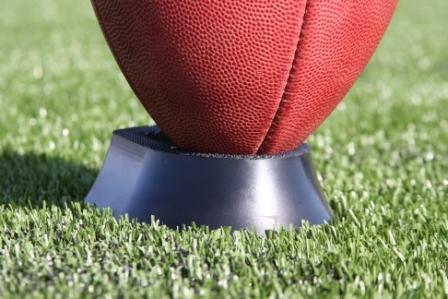 Up through the high school level, kickers are allowed to use a one or two inch elevated kickoff kicking tee. At the college and professional level, kickers use a one inch kickoff kicking tee. Young kickers should start with the two inch kickoff tee to take advantage of the higher elevation to get more lift on the football. The Football Kick Off Tee Used By College And Professional Teams! Covered by two U.S. patents, this tee was introduced in 2004 and is the first of its kind! The Ground Zero Kick Off Tees and the Toe-Tal-Tee are the most innovative kicking tees in the football marketplace. The ideas were conceived and patented by Attorney H. Jay Spiegel who formerly kicked for Cornell University. The Ground Zero 1 kicking tee consists of a one-inch kickoff tee manufactured in the color black and which was used in the 1999-2000 NFL season by 28 of 31 teams, and since then by every NFL team. This tee has been featured in the last eight Super Bowls and Pro Bowls, in movies including: On Any Given Sunday – starring Al Pacino, and in advertising including an introductory piece preliminary to Super Bowl XXXIV featuring Tiger Woods and Kirk and Michael Douglas. The Ground Zero 2 kicking tee is the two-inch version of the Ground Zero 1 kicking tee.